Chances are, you’ve encountered one of the many construction projects on campus already. While it may not seem incredibly disruptive, the number of ongoing projects over the next few years are sure to have an impact on such a small campus. Among the projects that the university is currently pursuing is the construction of the Mulroney Institute of Government, and the renovation of the Oland Centre and Nicholson Tower. The ambitious Xaverian Commons project also includes building the StFX Ceremonial Flag Plaza and the Centre for Health Innovation over the next couple of years. Despite the advantages to updating campus infrastructure, is it worth going through the chaos of construction? One of the immediate impacts of all the ongoing construction projects is the amount of noise they produce. Unfortunately, the heavy machinery involved and the general process of creating a building means construction is rarely a quiet process. That noise can prove to be distracting for classes and offices surrounding the construction areas. Not to mention, the loud intermittent clangs from the construction areas don’t always inspire confidence in the final product or the safety of those areas. Navigating around campus has become a constant guessing game while the construction is underway. Moving between classes now means figuring out how to efficiently get through closed roads and manoeuvre between upper and lower campus, among other things. The construction at StFX makes campus less accessible, an issue the university already struggles with. Those who drive face difficulties during construction as well, including limited parking space. Already scarce parking spots are being enforced with parking passes for the second year in a row, adding another factor to keep track of for those commuting to campus. Furthermore, it’s more difficult to drive through campus with the ongoing construction projects, especially those blocking portions of the road in the middle of campus. Construction is causing havoc in terms of class and office locations. Classrooms have been created in almost every building on campus, which are not always the most accommodating to technology or learning in general. Some faculty and staff offices have been moved twice over the last year, with another move to come when Nicholson Tower reopens, disrupting their capacity to get work done on campus. The construction doesn’t come without financial costs. This is the first year that a $125 fee has been added on student accounts to fund the new Fitness Centre. The fee was subject to a referendum last year, and the expansion is a welcome project for the Oland Centre; on the other hand, this new fee will be paid over the next 10 years, which means current and future students will feel the impact on their bank accounts over their time studying at StFX. Many senior and junior students won’t get to see the final product of the construction projects, even though they’ve funded part of them through tuition fees. It may be only eight more months until the Mulroney Institute opens for most people on campus, but not all. While there’s always the chance to see the changes by coming back for homecoming, it might make dealing with the effects of construction a bit more justifiable if upper year students got a glimpse of the final product before graduating. 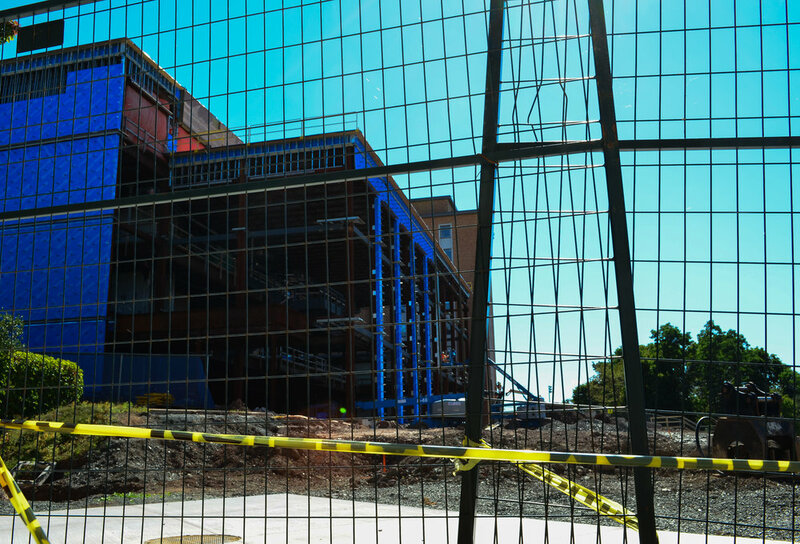 Construction on campus causes many headaches, especially as students begin to settle into the routines of the academic year. Hopefully the inconveniences will be worth the investment the university is making into updating and beautifying campus; but until the projects are finished, it might be worthwhile to invest in a hard hat to get in the spirit of the challenges facing construction on campus.